DC has another winner! We all have a superhero inside of us -- it just takes a bit of magic to bring it out. In 14-year-old Billy Batson's case (Asher Angel), all he needs to do is shout out one word to transform into the adult superhero Shazam (Zachary Levi). Still a kid at heart, Shazam revels in the new version of himself by doing what any other teen would do -- have fun while testing out his newfound powers. But he'll need to master them quickly before the evil Dr. Thaddeus Sivana (Mark Strong) can get his hands on Shazam's magical abilities. Admittedly, I was a bit concerned with the first act of the film as it seemed corny and takes its time to warm up, but the moment Zachary Levi turns up is when the film truly soars. His relationship with the other foster kids is both hilarious and heartwarming-especially with the wise cracking Freddy Freeman (Jack Dylan Grazer) who is terrific in this film. The third act is pure thrills and the film ends on a final scene that will put a huge smile on any comic book nerds face. It’s rare these days when the whole audience ends the film in applause and leaves thoroughly entertained and grinning. Highly recommended. Struggling circus owner Max Medici (a great Danny DeVito) enlists a former star (Colin Farrell) and his two children to care for Dumbo, a baby elephant born with oversized ears. When the family discovers that the animal can fly, it soon becomes the main attraction -- bringing in huge audiences and revitalizing the run-down circus. The elephant's magical ability also draws the attention of V.A. Vandevere (Michael Keaton) an entrepreneur who wants to showcase Dumbo in his latest, larger-than-life entertainment venture. Disney’s latest live action remake of the classic 1941 film isn’t a miss nor is it a hit either. Directed by Tim Burton it’s a-play it safe and by the books-film, that children and families should enjoy but doesn’t have any reason to exist otherwise. Nevertheless, I was still charmed by the production value and the solid cast. Captain Marvel (Brie Larson) is an extraterrestrial Kree warrior who finds herself caught in the middle of an intergalactic battle between her people and the Skrulls. Living on Earth in 1995, she keeps having recurring memories of another life as U.S. Air Force pilot Carol Danvers. With help from Nick Fury, (A rejuvenated Samuel L Jackson) Captain Marvel tries to uncover the secrets of her past while harnessing her special superpowers to end the war with the evil Skrulls. Overall, the film is entertaining but it does not break any new ground. The first third of the film is a bit convoluted and hard to follow but once things kick off in 1995s planet earth things get more exciting. The 90s nostalgia is well done and the music soundtrack works well. The buddy cop like banter between Fury and Danvers adds charm to the film as does Goose the adorable, scene stealing cat and a surprisingly plot twist that I did not see coming. A solid addition to the Marvel Universe and I’m excited to see how Captain Marvel fits into Avengers: Endgame, which we get a little sneak peak of in the after credits scene. I’m a huge fan of this franchise from Dreamworks Animation, which began with an unlikely friendship between an adolescent Viking named Hiccup (Jay Baruchel) and a fearsome Night Fury dragon. How to Train Your Dragon: The Hidden World is the third and final installment and Hiccup is now chief and ruler of Berk alongside Astrid (America Ferrera) who together have created a gloriously chaotic dragon utopia. When the sudden appearance of a female Light Fury coincides with the darkest threat their village has ever faced, Hiccup and Toothless must leave the only home they’ve known and journey to a hidden world thought only to exist in myth. As their true destines are revealed, dragon and rider will fight together to protect everything they’ve grown to treasure. The A-list voice cast all return (including Jonah Hill, Kristin Wiig, Cate Blanchett and Kit Harrington) and the visuals are once again stunning bringing both action and heart that all ages alike will enjoy. What truly elevates this film is it’s emotional and bittersweet ending. It actually brought a tear to my eyes and is a fitting end to this beloved series. 5 years after the events of the first film, the citizens of Bricksburg face a dangerous new threat when LEGO DUPLO invaders from outer space start to wreck everything in their path. The battle to defeat the enemy and restore harmony to the LEGO universe takes Emmet (Chris Pratt) Lucy (Elizabeth Banks), Batman (Will Arnett) and the rest of their friends to faraway, unexplored worlds that test their courage and creativity. The sequel to the smash hit LEGO Movie bring plenty of laughs and charm even if its doesn’t quite match the genius of its predecessor and is a good time out in the cinema for kids and adults alike. It also brings a surprisingly deeper message of sharing this world together in harmony which we could all do with right now. Once home to the most advanced civilization on Earth, the city of Atlantis is now an underwater kingdom ruled by the power-hungry King Orm (Patrick Wilson). With a vast army at his disposal, Orm plans to conquer the remaining oceanic people -- and then the surface world. Standing in his way is Aquaman (Jason Momoa), Orm's half-human, half-Atlantean brother and true heir to the throne. With help from royal counselor Vulko (Willem Dafoe) and Princess Mera (Amber Heard) Aquaman must retrieve the legendary Trident of Atlan and embrace his destiny as protector of the deep. of Atlantis and the sea is quite spectacular as are the action sequences and visuals. Where the film does suffer is in the clunky plot and dialogue-some of which is plain awful. Many of the jokes also fall flat. Despite this I was still entertained overall and do recommend this as a fun spectacle to see during the holidays on the big screen. On the run in the year 1987, Bumblebee the Autobot seeks refuge in a junkyard in a small California beach town. Charlie (Hailee Steinfeld) on the brink of turning 18 years old and trying to find her place in the world, soon discovers the battle-scarred and broken Bumblebee. When Charlie revives him, she quickly learns that this is no ordinary yellow Volkswagen. Full disclaimer: I’m a huge fan of the Transformers having grown up in the 80s and I actually enjoyed the first three films that came out—the less said about the last two, the better. Bumblebee along with Optimus Prime have always been my favorite characters so it wasn’t too hard to please me during this film. As a Transformers film it did feel same old same old but it is elevated by the always watchable Steinfeld and the fun 80s setting which gives perfect doses of nostalgia. John Cena is wasted in a stereotypical macho role and the rest of the acting is mediocre at best. Overall, a fun time at the movies even if it doesn’t add anything particularly new to the franchise. Now an adult with three children, bank teller Michael Banks (Ben Whishaw) learns that his house will be repossessed in five days unless he can pay back a loan to the nefarious bank owner Mr Weatherall (Colin Firth). His only hope is to find a missing certificate that shows proof of valuable shares that his father left him years earlier. Just as all seems lost, Michael and his sister Jane (Emily Mortimer) receive the surprise of a lifetime when Mary Poppins -- the beloved nanny from their childhood -- arrives to save the day and take the Banks family on a magical, fun-filled adventure. Emily Blunt shines in the titular role and there’s no denying the films charm yet while I did enjoy the spectacle of the musical numbers I also didn’t find any of them particularly memorable. The film has a hard time living up to the glory of the original which is practically perfect in every way. Despite that, I enjoyed it rather a lot and think it will open up Mary Poppins to a whole new generation. Bitten by a radioactive spider in the subway, Brooklyn teenager Miles Morales (voiced by Shameik Moore) suddenly develops mysterious powers that transform him into the one and only Spider-Man. When he meets Peter Parker (Jake Johnston) he soon realizes that there are many others who share his special, high-flying talents. Miles must now use his newfound skills to battle the evil Kingpin (Liev Schreiber) a hulking madman who can open portals to other universes and pull different versions of Spider-Man into our world. The incredibly talented voice cast also includes Hailee Steinfeld, John Mulaney, Lily Tomlin, Kathryn Hahn, Mahershala Ali and Nicolas Cage. Into the Spider-Verse has been met with such hype and critical acclaim I decided I had to check it out at the cinema and overall I was not disappointed. It’s a true love letter to comic book fans and Marvel’s most beloved character. The animation is gorgeous and brings the comic books to life on the big screen and the music score is especially effective. There are some wonderful nods to the previous movies and comics and a heart warming cameo from the late and great Stan Lee. Unfortunately, where the film did fall apart for me was in its third act as there were so many new characters introduced and so much happening; I quite honestly lost track of what was going on and lost interest. I will need to revisit this one to see if I still feel the same way but overall this was a fun movie and a must see for all Spider-man fans for certain. Human child Mowgli (Rohan Chand) is raised by a wolf pack in the jungles of India. As he learns the often harsh rules of the jungle, under the tutelage of a bear named Baloo (voiced by Andy Serkis) and a panther named Bagheera (Christian Bale), Mowgli becomes accepted by the animals of the jungle as one of their own, but the fearsome tiger Shere Khan (Benedict Cumberbatch) doesn't take a liking to him. But there may be greater dangers lurking in the jungle, as Mowgli comes face to face with his human origins. Mowgli is a passion project that underwent years of development hell from director Andy Serkis-the king of motion capture-which is used to full effect in this version of the classic tale by Rudyard Kipling. It’s unfortunate that the success of the film has been overshadowed by the wildly popular Jungle Book movie released in 2016 by Disney but that doesn’t mean there isn’t something worth watching here. This is a far more adult oriented version and is darker and has some truly scary moments that might be too harsh for younger children. I’m glad it’s getting a release on Netflix so there is a wide platform for audiences to watch this version as it’s a solid film in its own right and deserves attention. A zombie apocalypse threatens the sleepy town of Little Haven -- at Christmas -- forcing Anna (newcomer Ella Hunt in a Star making turn) and her friends to fight, slash and sing their way to survival, facing the undead in a desperate race to reach their loved ones. But they soon discover that no one is safe in this new world, and with civilization falling apart around them, the only people they can truly rely on are each other. Anna and the Apocalypse is a rom-com zombie high school Christmas musical unlike anything else you’ve seen that is a cult classic in the making. The cast of unknown actors are all excellent with characters you are immediately rooting for. The musical numbers are so much fun and the songs are so catchy you will be downloading the soundtrack immediately afterwards. There is tons of gore to go around with plenty of laughs too but also a genuine dose of heart and real human emotion that will take you by surprise. I loved every single minute of it and hope this film finds a larger audience and becomes the smash hit it deserves to be. Highly recommended. In "Ralph Breaks the Internet," video-game bad guy Ralph (voice of John C. Reilly) and best friend Vanellope (voice of Sarah Silverman) leave the comforts of Litwak's arcade in an attempt to save her game, Sugar Rush. Their quest takes them to the vast world of the internet where they rely on the citizens to help navigate their way. Lending a virtual hand are Yesss (voice of Taraji P. Henson), the head algorithm and the heart and soul of the trend-making site "BuzzzTube," and Shank (voice of Gal Gadot), a tough-as-nails driver from a gritty online auto-racing game called Slaughter Race, a place Vanellope wholeheartedly embraces--so much so that Ralph worries he may lose the only friend he's ever had. It’s a solid sequel and certain to be a hit with families and kids and especially shines when our heroes visit Disney and interact with all the characters, including the Disney Princesses. A fun time at the cinema for big and small kids alike. In 1985’s Rocky IV (shamelessly my favorite in the series), Russian boxer Ivan Drago (Dolph Lundgren) killed former U.S. champion Apollo Creed in a tragic match that stunned the world. Against the wishes of trainer Rocky Balboa (Sylvester Stallone) Apollo's son Adonis Johnson (Michael B. Jordan) accepts a challenge from Drago's son -- another dangerous fighter. Under guidance from Rocky, Adonis trains for the showdown of his life -- a date with destiny that soon becomes his obsession. Now, Johnson and Balboa must confront their shared legacy as the past comes back to haunt each man. The film has pacing issues and is undeniably formulaic but the third act and final showdown is nevertheless exhilarating for new and old fans alike. A solid sequel that continues the Rocky/Creed legacy into a new generation. OUTLAW KING tells the untold, true story of Robert the Bruce (Chris Pine doing a decent enough Scottish accent) who transforms from defeated nobleman to outlaw hero during the oppressive occupation of medieval Scotland by Edward I of England. Despite grave consequences, Robert seizes the Scottish crown and rallies an impassioned group of men (including a maniacal Aaron Taylor Johnson) to fight back against the mighty army of the tyrannical King and his volatile son, the Prince of Wales. The film acts as a sort of spiritual sequel to 1995s far more superior Braveheart yet still provides solid entertainment with gorgeous cinematography (the film was shot on location in Scotland) and brutal battle sequences. The ending is somewhat abrupt and leaves you begging for more. Newcomer Florence Pugh is also a stand as Elizabeth De Burgh and the wife of Robert the Bruce. Bohemian Rhapsody is a good film that starts strong but takes some liberties with the facts and suffers from pacing issues in the middle but is especially entertaining in its final act. Rami Malek’s performance as Freddy Mercury however is a true joy and the beating heart of the film. It’s a show-stopping and Oscar worthy performance that I’d like to think Freddy Mercury himself would be proud of. Malik is certainly going places. The movie as a whole, (produced by band members Brian May and Roger Taylor) is really a foot-stomping “PG-13” celebration of Queen, their music and the extraordinary lead singer Freddy mercury who died of AIDS at the age of 45. It traces their struggles to get started and meteoric rise to fame and culminates in their reunion at Live Aid in 1985 where they give one of the greatest live performances in rock and roll history. I’ll always remember being mesmerized watching them perform on TV as a child during that concert and the re-enactment in this film is sublime. The rest of the cast are solid and there’s a fun cameo from Mike Myers almost unrecognizable as a music producer who also gives a fun wink to his own head bopping scene to the titular song in Wayne’s World. Despite the lackluster critical reception this is still a crowd pleaser celebrating one of the best rock bands in history and its enigmatic lead singers legacy. Definitely recommended. One of Marvel’s greatest and most complex characters takes center stage as Eddie Brock (Tom Hardy) becomes the host for the alien symbiote Venom. As a journalist, Eddie has been trying to take down the notorious founder of the Life Foundation, genius Carlton Drake (Riz Ahmed) – and that obsession ruined his career and his relationship with his girlfriend, Anne Weying (Michelle Williams). Upon investigating one of Drake’s experiments, the alien Venom merges with Eddie’s body, and he suddenly has incredible new superpowers, as well as the chance to do just about whatever he wants. Fueled by rage, Venom leaves Eddie wrestling to control dangerous abilities that he also finds empowering and intoxicating. As Eddie and Venom need each other to get what they’re looking for, they become more and more intertwined and this is where the movie truly shines. Venom does take some time to warm up to with its obligatory and plodding origin story taking up the first half of the movie and Tom Hardy’s American accent takes some getting used to although he gives an otherwise fully committed performance. However, once Eddie does bond with Venom, the relationship is surprisingly comical as they spa with one other and it’s a lot of fun. Critics clearly don’t know the comic book character of Venom as the 2nd half of the movie is packed full of action and LOTS of Venom which is brought right from the comic book to the screen with impressive CGI. It’s a lot more entertaining than I expected it to be even if it is watered down by its PG-13 rating. Overall, a good time at the cinema and a must see for all comic book fans. My wife was dying to see this film so I took her partly because I wanted to make her happy but also out of genuine curiosity. The film is ground breaking for a Hollywood movie having an all Asian cast (only done once before in 1993's Joy Luck Club) and has been receiving rave reviews and opened at No. 1 at the US box office when it came out last weekend. I was pleasantly surprised to find this is an above average romantic comedy with a ethnic spin on the Asian culture that is quite poignant. The plot involves a New York raised Asian Rachel Chu (a star making turn from Fresh Off The Boat’s Constance Wu) who is happy to accompany her longtime boyfriend, Nick, to his best friend's wedding in Singapore. She's soon surprised to learn that Nick's family is extremely wealthy and he's considered one of the country's most eligible bachelors. Thrust into the spotlight, Rachel must now contend with jealous socialites, quirky relatives and something far, far worse -- Nick's disapproving mother (a brilliantly reserved Michelle Yeoh). The film has some truly laugh out loud moments mostly courtesy of rapper turned actor Awkwafina, who steals every scene she is in and the always reliable Ken Jeong. It also does not shy away from family drama and at times the film does lag when it gets too serious in these moments. Overall, this is an enjoyable film with a very likable leading lady and cast that every nationality can enjoy. No wonder the sequel has already been green-lit. Believe the hype. 22 year later and 6 movies in, the Mission Impossible franchise is a rare one where the films just get better and Fallout sets the bar to a whole new level. Consider this statement when it is being made against Ghost Protocol and Rogue Nation which were both already equally amazing. Where MI films have become famous for the insane tent pole stunts that it’s ageless star puts himself through, Fallout has about half a dozen of these sequences. It truly is one of the best action films ever made. Ethan Hunt (Tom Cruise at 56 years of age) and his IMF team (Alec Baldwin, Simon Pegg, Ving Rhames) are back along with some familiar allies (Rebecca Ferguson, Michelle Monaghan) in a race against time after a mission gone wrong. Henry Cavill, Angela Bassett, and Vanessa Kirby also join the dynamic cast with filmmaker Christopher McQuarrie returning to the helm. The stakes are very real this time with danger at every corner. The fight scenes-especially the bathroom brawl-are wrought with bare knuckle tension. Tom Cruise runs for his life across London rooftops among others and the infamous jump where he broke his ankle in real life is kept in the movies all for the viewers entertainment. And then he just keeps on running. The Halo jump is even more spectacular when you know it is actually Cruise doing it and surprisingly orchestrated with a dose of humor for good measure. The bike chase sequence in France is another highlight as Cruise literally races against traffic at top speed. Finally the films third act is set against the gorgeous tapestry of Kashmir and sees Cruise climb onto a helicopter IN MID AIR and then fly it around himself in pursuit of the villain. Yes he got his helicopter license so he could fly himself. Now that’s dedication. It’s also kind of nuts but you have got to respect the commitment to bringing a raw and authentic experience to the audience. Wade Eastwood the Stunt Coordinator for the film gets special kudos in the credits and this is more than deserved. I love how Simon Pegg has become such a permanent fixture of the franchise as Benji along with Ving Rhames Luther and Rebecca Ferguson’s MI6 agent Ilsa Faust is absolutely Ethan Hunts equal. Then there’s Henry Cavill as CIA assassin August Walker. Yes the mustache was worth it (apologies to Justice League) and his character is pure rock solid might with a touch of mystery. This is a must see in IMAX and perfect summer entertainment. I don’t recall the last time I saw so many members of the audience gasping and leaning forward in sheer suspense throughout the movie. I don’t know where the franchise is going to go from here but I am all in. When Ant-Man came out in 2015, it was a bit of an underdog. Paul Rudd seemed an odd casting choice and we didn’t know if it was a superhero movie anyone was asking for. What a pleasant surprise it was when the film became a commercial and critical hit and won audiences over, so much so, that Ant-Man featured in Captain America Civil War and a sequel to his own franchise was soon announced. Ant-Man and the Wasp comes 3 years later and finds Scott Lang (Paul Rudd) under House arrest following the events of Civil War. Scott is soon drawn into a new mission to assist Hope Van Dyne (Evangeline Lily) and Hank Pym (Michael Douglas) rescue her mother and the original Wasp (Michelle Pfieffer) who has been stuck in the quantum realm for 30 years. As Ant-Man teams up with Hope aka the Wasp they soon encounter a new villain by the name of Ghost (Hannah John-Kamen) which has got to be one of the blandest villains Marvel has yet to offer. There is not much more to the plot worth mentioning yet overall the movie is still good fun packed with decent laughs and action sequences that are particularly benefitted by 3D. The supporting cast also elevates the film with Michael Pena returning as Scott Lang’s old cell mate and sidekick Luis, once again stealing every scene he is in and Randall Park as a goofy FBI Agent overseeing Lang’s house arrest. The film doesn’t offer anything new but is a welcome escape following the dour events of Avengers Infinity War - or so you think - as an after credits scene soon reveals. Overall this a fun yet formulaic film that doesn’t really have any other reason to exist. I would however run to buy a ticket to watch a spin off about Michael Pena’s character Luis and his ragtag crew go on adventures of their own. Overall, this is good old fashioned summer entertainment no more, no less. Three years after the destruction of the Jurassic World theme park, Owen Grady (Chris Pratt) and Claire Dearing (Bryce Dallas Howard) return to the island of Isla Nublar to save the remaining dinosaurs from a volcano that's about to erupt. They soon encounter terrifying new breeds of gigantic dinosaurs, while uncovering a conspiracy that threatens the entire planet. Now if that plot sounds ridiculous, that’s because it is. This is the kind of film where you check your brain at the door if you want to be entertained. It’s a mixed bag overall. The dinosaurs are of course the big draw and dazzling to watch on the big screen. It’s solid summer entertainment and considering the film has topped a billion dollars in just a few weeks, it’s clearly a hit with families the world over. There are some scary moments and I was surprised how much I enjoyed the relationship between Owen and Blue (the Velociraptor he raised from the first film). Pratt is likable enough that he sells it. Bryce Dallas Howard’s character however made no sense to me since she suddenly turned from a corporate money hungry operations manager in the first film to an activist for dinosaur rights who cries every time a dinosaur is in danger in this one. Her sidekicks are even more grating, especially Justice Smith who plays the geek tech guy Franklin. He’s supposed to be the comic relief but instead I just found relief when he stopped being on screen. Jeff Goldblum is a joy to see, returning as Ian Malcolm but alas has little more than a cameo appearing for a minute at the beginning and at the end of the film. After 2 hours of mindless-yet entertaining nonsense-I did like the way the film ended, paving the way for new directions the franchise can now go. Overall, this is a fun yet forgettable romp but nevertheless it leaves the Jurassic World franchise very much alive. Everyone’s favorite family of superheroes is back but this time Helen (Holly Hunter) is in the spotlight, leaving Bob (Craig T. Nelson) at home with super kids Violet and Dash to navigate the day-to-day heroics of “normal” life. It’s a tough transition for everyone, made tougher by the fact that the family is still unaware of baby Jack-Jack’s emerging superpowers. When a new villain called the Screenslaver hatches a brilliant and dangerous plot, the family and Frozone (Samuel L. Jackson) must find a way to work together again to save the day. The long awaited sequel from writer and director Brad Bird doesn’t break any ground with its story line but what it does deliver on is explosive action sequences and putting baby Jack Jack front and center to showcase his cuteness. Needless to say, the super baby steals every scene he is in and delivers most of the movies most laugh out loud and joyful moments. Fan favorite Edna Mode also appears-all too briefly-yet enough to share her signature sarcasm and wit for our entertainment. The Incredibles 2 doesn’t surpass the original classic but is still an efficient and enjoyable sequel that the whole family can enjoy. Young Han Solo (Alden Ehrenreich) finds adventure when he joins a gang of galactic smugglers led by Tobias Beckett (Woody Harrelson) and meets a 196-year-old Wookie named Chewbacca. Indebted to the gangster Dryden Vos (Paul Bettany), the crew devises a daring plan to travel to the mining planet Kessel to steal a batch of valuable fuel called coaxium. In need of a fast ship, Solo meets Lando Calrissian (Donald Glover) the suave owner of the perfect vessel for the dangerous mission -- the Millennium Falcon. Overall, Solo is a fine film. But it should have been a fantastic one. Yes, the film was mired in pre-production dramatics with directors Phil Lord and Chris Miller getting fired mid production and Ron Howard taking over, so who knows which vision is the final result we are watching on the big screen. The film was also released at the worst time possible-breaking away from the Christmas tradition of all previous Star Wars films of late-coming out right in the middle of Avengers Infinity War and Deadpool 2 so has become the first true box office bomb in the Star Wars franchise reboot from Disney. It was disheartening to see the theatre so empty. But overall it is also just not a great film. The directing and acting is all fine. But it adds nothing new. The one big reveal at the end of the movie seemed out of left field and had no other purpose other than fan service. The action sequences are entertaining enough but never truly thrilling. The film also tries too hard to be funny but I felt that the majority of the jokes landed with a thud, bar a few. I did like seeing Han and Chewy and the Falcon and for this it’s worth watching but again we got an overall decent movie when we should have gotten a spectacular one. Deadpool was not only a critical and commercial smash hit when it came out in 2016 but also a groundbreaking film for superhero movies with its Hard R rating and completely tongue in cheek and original take on the genre. Sequels rarely get better than the original and in this case, DP2 doesn’t break any new ground. However, what it does do, is continue the meta gags and fourth wall breaking complete with an original song from Celine Dion for the opening while also piling on high octane action sequences. The result is still a lot of fun. The plot follows Wade Wilson aka Deadpool (gleefully played again by Ryan Reynolds who has made the character completely his own) reunited with fiancée Vanessa (Morena Baccarin) as he continues with his own brand of superhero crime-fighting. 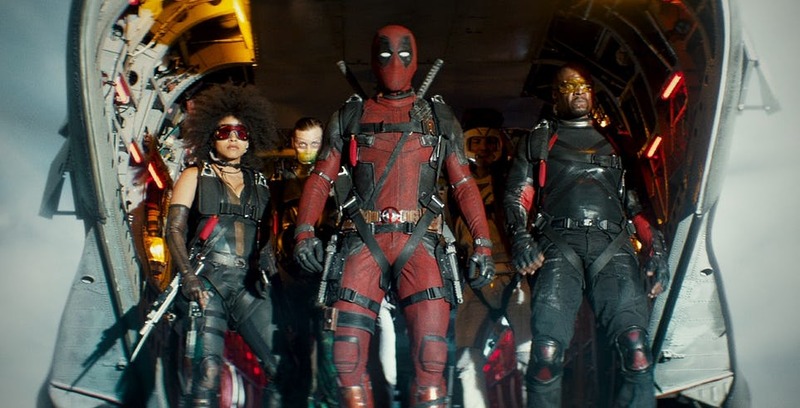 But when fellow mutant Cable (a tough as nails Josh Brolin) travels from the future to kill a super-powered child, Deadpool forms team X-Force to take him on. There are plenty of fun jokes and little nuggets throughout the film some which are pure genius and a mid credits sequence at the end which is worth the price of the ticket alone. The supporting cast is solid with stand out performances from newcomer Zazie Beets as Domino whose superpower is “luck” and Hunt for the Wilder people’s Julian Dennison as Russell Simmons aka Fire-Fist, the aforementioned super powered child Deadpool sets out to save. It’s a ton of fun and must see summer entertainment even if it doesn’t quite live up to the original. Okay. Wow. Please bear with me while I attempt to convey into words the cinematic marvel and sheer madness of what I just watched. Infinity War is the culmination of a fully formed Marvel Universe spread out over the last 10 years and 18 movies. We know these characters and we care about them deeply. There is so much packed into this 2 1/2 hour film that it can seem overwhelming at times but it is all meticulously crafted and thought out. First and foremost, the super villain Thanos (brilliantly portrayed by Josh Brolin through motion capture and voice over) is a fully realized character with immense strength and singular purpose. The films plot revolves around the much talked about infinity stones and his goal to gather each one to complete the gauntlet he wears and become the most powerful entity in the universe. It is no hyperbole to say that Thanos is the best comic villain ever put to screen. There are REAL stakes here and you feel it right from the opening scene. Thor is paired up with the Guardians of the Galaxy in space and the interactions here are some of the films best comic moments. On earth, Iron Man and Spider-Man are paired up with Doctor Strange attempting to stop the impending invasion. Meanwhile, Vision (holding one of the infinity stones in his forehead) and the Scarlet Witch are in a hideaway in Scotland where they meet up with Captain America, Black Widow and Falcon thwarting attempts from minions of Thanos to retrieve the stone. They all end up in Wakanda reuniting with Black Panther, The Hulk, War Machine, and The Winter Soldier. Here is the stage for the climactic battle on earth against the full might of Thanos and his army and the battle is glorious. However, nothing will prepare you for the gut punch that is the films final act. It is so brilliantly executed that it takes all of our expectations and predictions and literally turns them upside down. I won’t say anymore but it was an ingenious ending for this film which is very much a cliff hanger that we will all have to wait on with baited breath until Avengers 4 finally comes round. 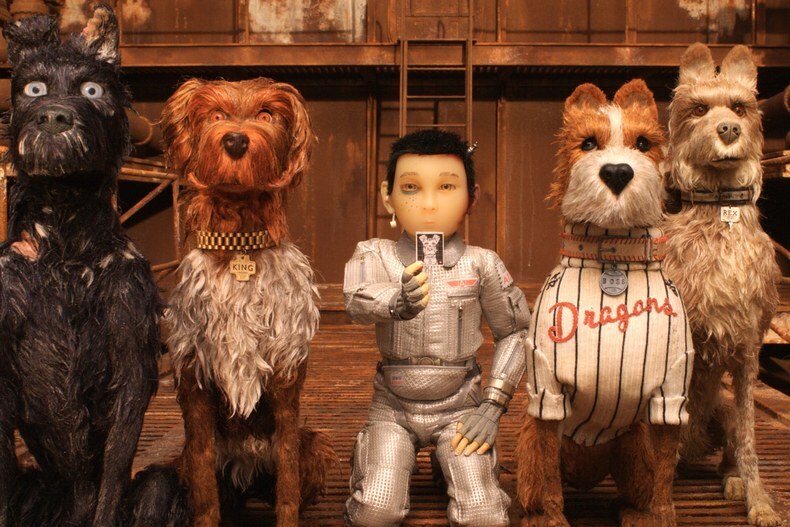 The new stop-motion-animated film from oddball auteur Director Wes Anderson is called Isle of Dogs (sounds like I LOVE DOGS) an ode to all dog lovers of the world, of which I am certainly one. The story is about an outbreak of canine flu in Japan 20 years in the future, which leads all dogs to be quarantined on a literal trash island. A boy called Atari journeys there to rescue his dog Spots (Liev Schreiber), and gets help from a pack of misfit canines who have also been exiled. His quest inspires a group of dog lovers to expose a government conspiracy. The stellar voice cast also includes Bryan Cranston, Edward Norton, Bill Murray, Scarlett Johansson, Tilda Swinton, Bob Balaban, Greta Gerwig, and Yoko Ono. It’s signature Wes Anderson and a fine film which truly shines during the brief moments that show the real emotional connection between man and his dog but which are overshadowed by the more generic plot and the third act which seemed a bit of a cop out to me. I just wish it had focused more on the emotion as then it would have been a true stunner. From master filmmaker Steven Spielberg comes the science fiction action adventure “Ready Player One,” based on Ernest Cline’s bestseller of the same name, which has become a worldwide phenomenon. The film is set in 2045, with the world on the brink of chaos and collapse. But the people have found salvation in the OASIS, an expansive virtual reality universe created by the brilliant and eccentric James Halliday (Mark Rylance). When Halliday dies, he leaves his immense fortune to the first person to find a digital Easter egg he has hidden somewhere in the OASIS, sparking a contest that grips the entire world. When an unlikely young hero named Wade Watts (Tye Sheridan) decides to join the contest, he is hurled into a breakneck, reality-bending treasure hunt through a fantastical universe of mystery, discovery and danger. Other than the basic premise, fans may be surprised how different the film is from the book; but it’s certainly in safe hands with Spielberg. In fact, there’s nobody better to put such a pop culture mash up to the screen and the film is elevated because of that. There are so many references it can make you dizzy. A highlight is a spectacular scene referencing “The Shining” which isn’t even in the book! The only true critique I could find is because the film is so action packed and non stop, it never does slow down enough to give time for the characters to breath and show any real emotional depth. That said, when you’re watching something so visually stunning and you’re having so much fun, it really doesn’t matter. Spielberg is back in fine blockbuster form. British author, screenwriter and director Alex Garland first came on my radar in the 90s when I read his critically acclaimed book “The Beach” which has remained one of my favorites ever since. As a screenwriter he went on to write “28 Days Later”, “Sunshine” and “Dredd”. Then as his film debut, he wrote and directed the acclaimed “Ex Machina”. It was a highly stylized slice of Sci-fi which critics hailed yet I honestly respected more than I loved it. Now with his latest film, the visionary and unsettling “Annihilation” Garland proves he is a singular talent as a director that is only just getting started. The plot follows an ex army biologist played by the always brilliant Natalie Portman-who after discovering her missing husband has reappeared and fallen sick-signs up for an expedition into a mysterious zone called “The Shimmer” with the hopes of saving him. She is accompanied by an all female squad and once they enter, to say that things go very bad and very strange from there would be an understatement. The film is a visual wonder and the themes are deep and puzzling yet I could not take my eyes off the screen until the very last frame. The supporting cast is all solid with Oscar Isaac, Jennifer Jason Leigh, Tessa Thompson and Gina Rodriquez. A visually stunning and thought provoking slice of Science Fiction that stands among the best. Definitely recommended. Jason Bateman and Rachel McAdams star as Max and Annie, whose weekly couples game night gets kicked up a notch when Max's charismatic brother, Brooks (Kyle Chandler), arranges a murder mystery party, complete with fake thugs and faux federal agents. So when Brooks gets kidnapped, it's all part of the game--right? But as the six uber-competitive gamers set out to solve the case and win, they begin to discover that neither this game--nor Brooks--are what they seem to be. Over the course of one chaotic night, the friends find themselves increasingly in over their heads as each twist leads to another unexpected turn. The premise is fun and shows promise at first but the film soon turns into an over the top action comedy with more jokes missing than they land and takes on too much for its own good. The whole third act in particular is ludicrous and left me unsatisfied and underwhelmed. MOLLY'S GAME is based on the true story of Molly Bloom, an Olympic-class skier who ran the world's most exclusive high-stakes poker game for a decade before being arrested by the FBI. Her players included Hollywood royalty, sports stars, business titans and finally, unbeknownst to her, the Russian mob. Her only ally was her criminal defense lawyer Charlie Jaffey (well played by Idris Elba) who learned that there was much more to Molly than the tabloids led us to believe. Admittedly, I was not lining up to see this film at first as I only knew it was about poker-which I have little interest in-but the fact that it was written and directed by Aaron Sorkin was intriguing to me. I’m so glad that I did because this film is about so much more and is a solid debut from Sorkin. What makes the film truly shine however is the lead performance from Jessica Chastain as Molly Bloom which I am genuinely surprised was overlooked by the Academy this year. She owns the role completely and is electrifying in every scene. The films dialogue is zippy and signature Sorkin and stand outs in the supporting cast also include Michael Cera (playing a Hollywood version of himself) and Kevin Costner as her tough as nails father. Far more entertaining and engrossing than I expected. After the death of his father, T'Challa (Chadwick Boseman) returns home to the African nation of Wakanda to take his rightful place as king. When a powerful enemy suddenly reappears, T'Challa's position as king ‑‑ and as Black Panther ‑‑ gets tested when he's drawn into a conflict that puts the fate of Wakanda and the entire world at risk. Directed by Ryan Coogler (Fruitvale Station, Creed) Black Panther is a solid and exciting entry in the Marvel Universe as well as a culturally significant one. Yes, Blade did come 20 years before with an African American superhero of sorts but this is the first blockbuster superhero film marketed for a wide family audience that is written, directed and starring a predominately African American cast. Yes it delivers an important message on race and equality but It’s also just a damn good film. The Star studded cast of supporting actors is fantastic with Dania Gurira (Michonne of Walking Dead fame) a huge stand out for me as the ferocious Wakandian warrior Okoye-she steals every scene she is in. Michael B Jordan is equally commanding as the villainous Killmonger and while his actions are not redeemable it’s hard not to sympathize with his character due to the events that lead him to be the way he is. It’s also a real blast seeing Martin Freeman (Bilbo!) and Andy Serkis (Gollum!) in a film together, although playing very different roles. The visuals are stunning for the most part however the CGI does get carried away at times. While the action sequences are thrilling when they come, there are a few dips in the film where it loses steam although things really pick up in the third act. Ultimately, Black Panther is a fun and entertaining addition to the Marvel Universe for the whole family to enjoy; no matter the color of your skin. Based on the unbelievable, but true events, I, TONYA is a darkly comedic tale of American figure skater, Tonya Harding, and one of the most sensational scandals in sports history. Though Harding was the first American woman to complete a triple axel in competition, her legacy was forever defined by her association with an infamous, ill-conceived, and even more poorly executed attack on fellow Olympic competitor Nancy Kerrigan. Featuring an iconic turn by Margot Robbie as the fiery Harding, a brilliantly slimy Sebastian Stan as her impetuous ex-husband Jeff Gillooly, a tour-de-force performance from Allison Janney as her acid-tongued mother, LaVona Golden, and an original screenplay by Steven Rogers, Craig Gillespie's I, TONYA is an absurd, irreverent, and piercing portrayal of Harding's life and career in all of its unchecked--and checkered--glory. THREE BILLBOARDS OUTSIDE EBBING, MISSOURI is a darkly comic drama from Academy Award winner Martin McDonagh (IN BRUGES, SEVEN PSYCHOPATHS). After months have passed without a culprit in her daughter's murder case, Mildred Hayes (Academy Award winner Frances McDormand) makes a bold move, painting three signs leading into her town with a controversial message directed at William Willoughby (Academy Award nominee Woody Harrelson), the town's revered chief of police. When his second-in-command Officer Dixon (Sam Rockwell), an immature mother's boy with a penchant for violence, gets involved, the battle between Mildred and Ebbing's law enforcement is only exacerbated. Superb writing, directing and scorching performances make this an unforgettable movie experience and one of the best films I’ve seen in years. Sam Rockwell and Frances McDormand in particular both give tour de force performances and are the ones to beat at the Oscars. I wouldn’t be surprised if the film takes Best Picture as well. It truly deserves it. In Lady Bird, Greta Gerwig reveals herself to be a promising new voice with her quirky directorial debut, uncovering both the humor and emotion in the turbulent bond between a mother and her teenage daughter. Christine "Lady Bird" McPherson (Saoirse Ronan) fights against but is exactly like her wildly loving, deeply opinionated and strong-willed mom (Laurie Metcalf), a nurse working tirelessly to keep her family afloat after Lady Bird's father (Tracy Letts) loses his job. Set in Sacramento, California in 2002, amidst a rapidly shifting American economic landscape, Lady Bird is an odd yet affecting look at the relationships that shape us, the beliefs that define us, and the unmatched beauty of a place called home. While I didn’t find the same wonder as most critics did I was still impressed with the performances and overall entertained.